A particular passage from the book made me light up. Serendipity at its best, again. "The five tiglio trees, old world lindens or limes, bear no fruit. They provide shade along the broad terrace beside the house when the sun will not allow us on the front terrace. We have lunch under the tigli almost every day. Their blossoms are like pearl earrings dangling from the leaves, and when they open - all it seems on the same day - fragrance envelopes the whole hillside. At the height of bloom, we sit on the upstairs patio, just adjacent to the trees, trying to identify the fragrance... ...it attracts every bee in town. Even at night, when we take our coffee up to the patio, they are working the flowers over. Their collective buzz sounds like a major swarm approaching. It's both lulling and alarming. Ed stays in the doorway at first because he's allergic to bee sting, but they aren't interested in us. They have their honey sacs to fill, their legs to dust with pollen." On the contemplative blog Beyond the Fields We Know, the author, Kerrdelune, wrote a post recently that wondered what kind of tree she might become, if she were evolving into one. A number of readers replied, and so did I, realizing that I would wish to be a linden, a tilia. I grew up near an old linden in NY. It was in a pocket of soil, moss, and wildflowers in the middle of a small rocky clearing, on top of a slate outcropping, stunted from lack of root depth, like a bonsai. It bloomed profusely and I remember the amazing hum of the bees when it did. I used to lie beneath it, on club mosses six inches deep and soft as a cloud, looking through the thick blossoms and smelling the pervasive sweet scent, slightly citrus. My soap in the shower right now is a big, french milled, linden bar. I close my eyes and smile a bone deep smile when I smell that fragrance. Sweet, simple, childlike. So when the passage from the book opened before me, spreading the images and scents at the beginning of the Texas trip, I was entranced. And I realized that I would not only be a tilia, I'd be Tiglio. My background is not Tuscan, but Sicilian. No matter... I'm sure the Sicilians also call it Tiglio, and love it's scent, and pronouce the "gl" in that liquid roll that is neither g, nor l, but somehow both at once. The way my Sicilian grandmother used to pronounce the name of her good friend, Mrs. Foglietta, who lived down a lovely dirt lane across the street, where dozens of tiny red efts would come out after a rain. It's all magic. Going further last night, I realized I'd be Tiglio Ridonando. Laughing Linden. 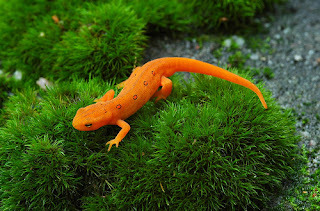 (Red eft photo from The Horned Jack Lizard's Flickr photostream). Now that's a lovely post. It made me think of our home in Des Plaines, Illinois. We didn't have a Linden, but I believe there were some lining the street on block from our house. We had lilacs, though, and there were lilacs that lined the railroad tracks yards from our large window. We'd open it in the late spring and the house would fill with the sweet lilac. There are two things I think are the smell of the color purple. Lilacs and blue bearded iris. 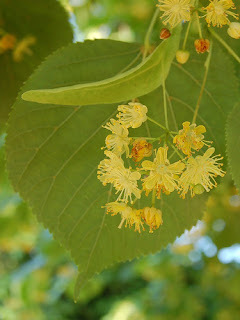 Now I'm compelled to find the scent of linden to see what that's like. We had huge lilac bushes (almost like trees) down one side of the yard in that same house (with the Linden up in the woods). The smell of lilac immediately transports me there. And I'm with you on purple.